His Eminence Yangton Menri Lopon Rinpoche presents the butter lamp offering. On November 4, 2017, on the 15th day of the 9th Tibetan month, Tashi Menri Monastery in Dolanji, India held memorial events to mark the 49th day after the passing into liberation of the 33rd Menri Trizin Lungtok Tenpé Nyima Rinpoche. By invitation of His Eminence Menri Lopon Trinley Nyima Rinpoche, the tulkus, professors, geshes, and monks assembled in the temple. There, before the precious cremation bones, ash and relics of the 33rd Menri Trizin Rinpoche, with a feeling of intense longing, they prostrated and recited the Prayer to the Victor Bön, His Holiness Lungtok Tenpé Nyima Rinpoche. Following that, the Praise of the Twelve Deeds of Shenrap Miwo Künlé Nampar Gyalwa was recited. Having formally presented the precious cremation bones, ash and relics to His Eminence Menri Lopon Rinpoche, he gifted each member of the monastic community with the actual accomplishment of the support for blessings, a majestic and empowered cremation bone. 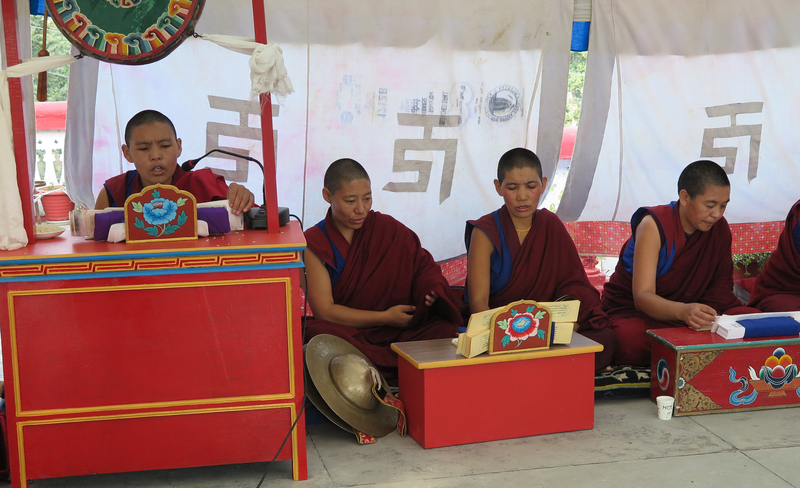 Nuns of Menri perform the Tsewang Bo Yulma Tsok. In the afternoon, the Menri community of nuns gathered and performed the Feast Offering of the Tséwang Bö Yulma. During this time, other monastic colleges within Menri Monastery performed various practices and rituals as well. 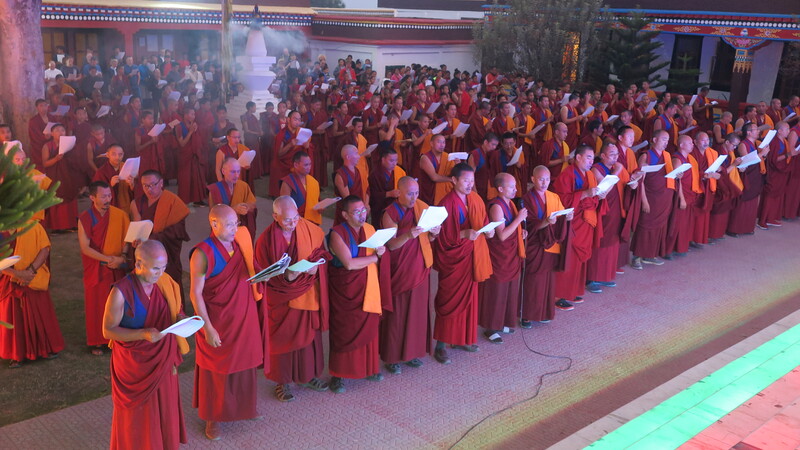 Later, everyone gathered outside in the courtyard and again recited the Praise of the Twelve Deeds and the Prayer to His Holiness Lungtok Tenpé Nyima Rinpoche. L-Cremation tsa tsa containing holy cremation bone. R-Public receiving a tsa tsa. From then until midnight, both the monastic community and the public offered butter lamps, prostrations, and circumambulated the lama residence where the 33rd Menri Trizin had lived. At midnight, the public were invited to come before HE Menri Lopon Rinpoche and to receive a holy tsa tsa containing a majestic cremation bone inside. All of these holy relics, which are imbued with extraordinary power, are objects of support for the faithful to receive unlimited blessings and to develop profound devotion. The Yungdrung Bon community chanting in the courtyard. Once everyone had received a holy tsa tsa, they gathered outside where HE Menri Lopon Rinpoche led the presentation of the five offerings, the recitation of Offerings to the Lama, and the Prayer to His Holiness Lungtok Tenpé Nyima Rinpoche. Posted on November 18, 2017, in Prayer and Ritual, Tibetan Lamas, Uncategorized, Yungdrung Bon Monasteries. Bookmark the permalink. 3 Comments.